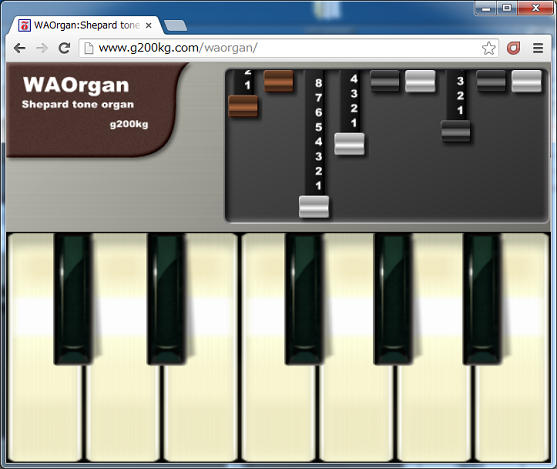 WAOrgan is a 'Full polyphonic Shepard's tone Organ App on Browsers'. WAOrgan is functional on PC browsers, but especially tuned for iPad / iPhone. Try with your iPad / iPhone (iOS 6 or later is required). Just access to following URL. Just has 1 octave keys, but the highest 'B' and lowest 'C' are consecutive. This is inspired by the 'Nanorgan' presented in the Analog Synth Summit 2012. Playable with Mouse, Touch or PC keyboard. PC keyboard is assigned as shown below. Drawbards are also available, that set the harmonics. Web Audio APIs and the polyfill 'WAAPISim' is used. Functional on Chrome / Safari / Firefox / Opera / MSIE.